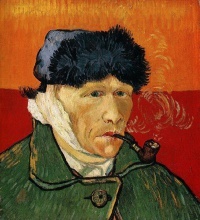 Self-Portrait with Bandaged Ear and Pipe, the purest version of the two ‘bandaged’ portraits. Vincent van Gogh‘s two Self—Portraits with Bandaged Ear are the most perfect visual expression of the concept of the tortured artist, an artist who in this particular case literally in an act of self-torture cut off his own ear. Van Gogh was a beautiful loser unacknowledged during his lifetime and posthumously rewarded with success. One other painting in the category ‘existential angst’ comes to mind, the far more famous The Scream, depicting an artist tortured by existential angst. This entry was posted in Uncategorized and tagged aesthetics, art, artist, life, philosophy, theory on May 6, 2014 by jahsonic.